Do we fully engage in all aspects of the areas that we invest and apply ourselves in? Process and productivity are two concepts which are interlinked, yet it can often feel as if emphasis is heavily placed on productivity alone. In spaces that have accumulation at the forefront, there is a tendency to seek out a quick and easy approach towards productivity instead of paying homage to process and the important role that it can play as we attain knowledge of ourselves in our journey through life. Textiles and the process of weaving have a longstanding presence in African history, dating back to 5000 B.C, and serve as a good indication of the skills and craftsmanship that has long existed in the continent. The Kente cloth within the history of the Asante Kingdom demonstrates the respect for process and production, and the important role that these two concepts play in promoting knowledge of self. Respect of process: The Kente cloth was promoted by the Astenhene to represent the people and pay homage to the craft of Kente cloth weaving. When noting the process of Kente weaving in the Asante Kingdom, Historian Sjarief Hale commented: “the tasks in the [Kente] production are established activities of the men and women, each of whom have allocated duties in its creation”. Women planted and harvested the cotton seed and prepared the silk that would be woven by men to produce the cloth. The cloth brought the community together through harvest, cultivation and craft which fostered a strong sense of unity in the Asante Kingdom and highlights the importance given to process. In her description of Kente motifs, Shea Clark Smith noted that “each weft design also has a name, so when ordering a cloth from the weaver, one must specify both the cloth and the designs to be incorporated”. Creating patterns and styles for the cloth was a process that was strongly tied to important cultural connotations or events in the kingdom. Therefore, the craftsmen were tasked with conveying a message through the designs they created in each Kente cloth. Respect of product: Given that the Asante kingdom was composed of a variety of Akan communities, the political structure consisted of many units, “the primary objective of these units was to work together to ensure economic and spiritual well-being of the people” as noted by Ghanaian historian Fasutine Ama Boateng. Bearing this in mind, the diversity of the kingdom was depicted in the Kente cloth, the variety of colours used in part to remind people of the process of the emergence of the kingdom i.e. coming together from different communities. Each colour in the cloth carries a meaning; black represents maturity and secrecy, yellow represents abundance and nature, green represents life and harmony whilst brown represents healing. 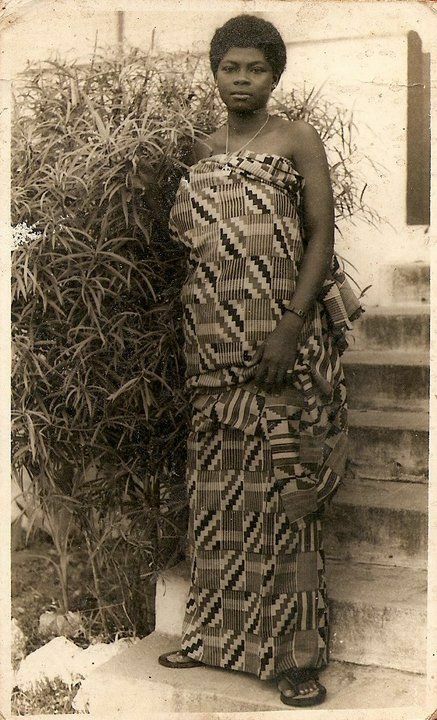 Some names of Kente cloths include Obaaokofo mmu man (one person cannot rule a nation) and Fa hia kotwere Agyeman (seek help from Ageyman) which also points to the use of the cloth to tell a story. When exploring our encounter with process and production it is important that we remember that the two go hand in hand; paying attention to the intricate aspects in the process of whatever we cultivate is just as important as the end goal. The Kente cloth and its presence in Asante history draws attention to the substance that exists in the product; the process of harvesting the cotton crop and weaving the cloth itself, along with the process of the kingdom’s emergence and the process of documenting events in the cloth, all point to a product that would not be regarded as what is it without all of these elements. This feature of Asante history teaches us the value of paying attention to all aspects of the production process, which forges greater respect and appreciation for a product. As we cultivate, may we appreciate the small steps just as much as the big steps.